The Central African Republic, which ratified the International Convention of Children’s Rights in July 1990, is committed to respecting, defending and promoting the rights of Central African children. In spite of its promise to do so, the country still faces important problems that prevent children from fully enjoying their rights. In the Central African Republic, 67% of the population lives on less than one American dollar per day. Families are thus unable to meet their children’s most basic needs. Poverty has extremely serious repercussions for children, seeing how their access to nutritious meals, healthcare and education is adversely affected. 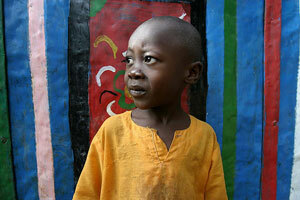 The mortality rate of children under the age of 5 remains a cause of concern in the Central African Republic. Each year, 171 children out of every thousand die. These deaths are in large part due to three things: an inadequate sanitation system, a lack of clean water and an absence of health services in rural regions. The prevalence of AIDS throughout the country is equally worrying. Generally, young Central Africans become infected with AIDS by means of maternal transmission, sexual violence or unsafe blood transfusions. In the Central African Republic, AIDS is not simply a health problem; it is also a socio-economic problem. In the Central African Republic, there has been a strong decline in the number of births that are reported to the authorities. Cost of certification, violent political conflicts and absence of civil services in certain regions have all discouraged families from officially registering the births of their children. 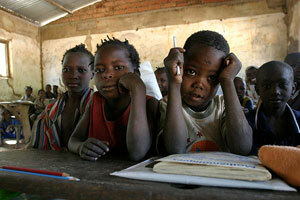 In the northern region of the Central African Republic, thousands of children frequent rudimentary “bush schools”. In this region, there is a notable lack of both qualified teachers and adequate infrastructure. Due to ongoing conflicts between rebel groups and government forces, disparities in access and quality are especially evident. Insecurity and violence are persistent problems in the Central African Republic; and children displaced through no fault of their own (as a result of being kidnapped, etc. ), are especially vulnerable. Globally, these children stand in urgent need of food, shelter, water, etc. Moreover, they are compelled to work so as to meet their own basic needs. They grow up in miserable conditions. And many of them, most notably the Peuhls, are the victims of discriminatory practices. Certain communities view them in a negative light—as highway bandits or worse. Throughout the country, numerous armed groups brutalize and terrorize communities; many children are kidnapped. Central African boys are given weapons and forced to commit atrocities: looting, arson, murder, etc. Girls are forced to do domestic work and more than a few are given as sexual slaves to the commandants. In the Central African Republic, child soldiers lack an important stage in their development. As a result their well-being, both short-term and long-term, is imperiled. Their right to an education is also compromised. 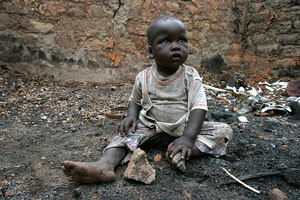 The Central African Republic is a known source and destination of child-trafficking. Children who are the victims of such a practice are often exploited sexually. Some are sold on the streets, while others are forced to work in the fields or in the mines. Still others are sent from the Central African Republic into other African countries where they are enrolled in armed guerilla groups.